Students, faculty, staff, stakeholders and members of the public mingle on the Lied Center stage as part of a reception following the Jan. 15 State of the University address. Chancellor Ronnie Green’s aspirational State of the University address on Jan. 15 received positive responses from many of the students, faculty, staff and stakeholders who attended. The hour-long talk at the Lied Center for Performing Arts highlighted the university’s 150-year history before venturing into Green’s vision for the institution by 2025 and beyond. Following the address, those in attendance were invited on stage to talk about the presentation while partaking in a new N150 celebration Dairy Store ice cream and hot chocolate. Megan Hunt, a state senator from Omaha representing District 8, liked that the speech was comprehensive and examined a variety of relevant issues. Overall, more than 1,250 watched the address either in person or via a livestream online. Attendance at the Lied Center was 637, which included three University of Nebraska regents, at least nine state senators and two members of the Lincoln City Council. Shirleena Terrell, a graduate student in educational administration, thought the chancellor’s focus on diversity and inclusion was important. That message also resonated with Catia Guerrero, an administrative associate in child, youth and family studies. An El Salvador native who has lived in Lincoln for more than 25 years and worked at the university for four years, she attended the speech to be part of an important milestone in the institution’s history. She was glad to hear Green discuss diversity and inclusion and savored learning about the university’s history. Guerrero also said she is extremely proud to work as a Husker. Much of the forward-looking part of the address was built upon an N150 Commission visioning report that examined what the university should be by the year 2044. Green charged more than 150 members of the campus community and stakeholders to prepare the document for the university’s 150th anniversary celebration in 2019. The report was released along with the speech on Jan. 15. William G. Thomas, professor of history, served as a co-leader of the N150 Commission. He said the document and chancellor’s address make him excited about the future student experience at Nebraska. Kay Woerner, a freshman from Bellevue, attended the speech out of curiosity about the future of her home state’s flagship university. She walked away excited about university outreach projects, including the Nebraska Preparatory Academy and the Gear Up initiatives. Brittni McGuire, a sophomore fisheries and wildlife major and president of Sustain UNL, enjoyed the forward-looking portion of the address. Jim O’Hanlon, emeritus professor of education and human sciences and a retired campus administrator, said Green’s broad, aspirational address is important to the overall health of the university. Ken Nickerson, professor of biological sciences, agreed with O’Hanlon. 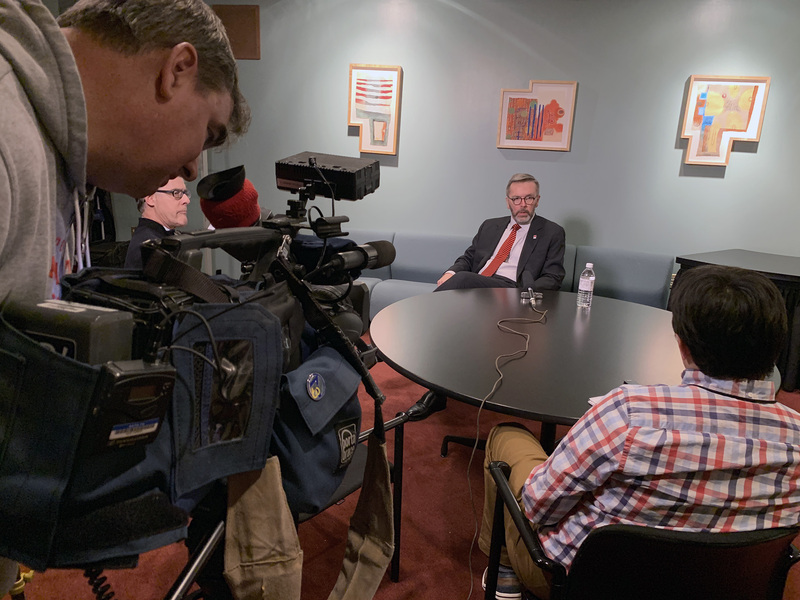 Local media members interview Chancellor Ronnie Green in the Lied Center Green Room following the State of the University address. Contributors to this story include Troy Fedderson, Deann Gayman, Sean Hagewood, Scott Schrage and Tyler Thomas.